The Perfect Health Diet was created by two scientists who observed the effect of poor eating habits on their bodies. By the age of forty they both had developed a variety of health problems and doctors were of little help. They began researching and experimenting with a low-carb Paleo diet and experienced dramatic health improvements. In this book they present their own unique approach to a Paleo style of eating. The Perfect Health Diet contains 20 percent carbohydrates, 65 percent fat and 15 percent protein by calories. Meals should have about three times as much plant food by weight in comparison to animal foods. Seaweed, bone broth, herbs, spices, vinegar, butter, coconut oil, olive oil and salt. You are also permitted to eat “pleasure foods” in moderation, for snacks and desserts. These include fruit and berries, dairy products, nuts, chocolate and wine. Everyone is advised to supplement with a daily multivitamin, vitamin C, D3 and K2, magnesium, selenium, iodine and chromium. Beef tendon, beef short ribs, ox tail, brain, bone marrow, liver, seafood, egg yolks, yogurt, cheese, avocado, seaweed, raspberries, strawberries, papaya, banana, fermented vegetables, white rice, rice noodles, sweet potato, yam, potato, taro, coconut milk, olive oil, almond meal, dark chocolate, green tea, coffee, wine. You should get regular exercise with varying degrees of intensity. Sprinting, jumping, and weight lifting is recommended if you want to lose weight. It is also important to get plenty of rest to allow your body to recover. 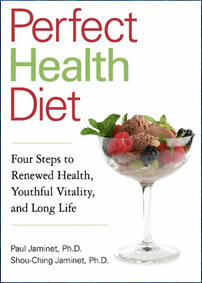 Perfect Health Diet: Four Steps to Renewed Health, Youthful Vitality, and Long Life retails at $24.95. Highlights the dangers of unhealthy fats. Educates readers about the health effect of different types of fiber. Provides detailed information about nutritional supplements. Allows wine and chocolate in moderation. Necessary to eliminate many foods including most grains, legumes and sweets. Diet is much higher in fat than is generally recommended. Does not distinguish between health effects of factory farmed and grass-fed meat or wild versus farmed salmon. Not specifically designed for weight loss. An exercise plan is not provided. Some readers may find the writing too technical. The Perfect Health Diet is similar to the Paleo Diet but with several important differences. The protein intake is lower and certain “safe starches” are a major part of the diet. This makes the macronutrient ratio comparable to that of Pacific islanders. This book provides a lot of information to help you get you started to make healthier choices. However, guidance on how to implement the diet on a practical basis will be insufficient for the majority of readers.